When the sun sinks behind the city walls, don’t think that the fun stops in St. Augustine! The historic district and beaches are filled with bustling nightspots to enjoy. For an upscale night on the town, you might visit a cozy wine or martini bar in the downtown area. If a casual gathering is more your speed, check out one of the many pubs and bars scattered across the city for a cold pint or adult beverage. If family fun is on the agenda, you might enjoy one of St. Augustine’s nightly ghost tours that run from dusk through midnight. Creeping through the city’s dark past of history and mystery can make for a memorable date or just a fun night for the whole family. Haunted pub tours are available for the adventurous ones of drinking age. On warm summer nights and on most weekends, the shops of St. George Street stay open late so you can cap off your evening with an after-dinner ice cream or pastry. Browse through our Nightlife listings for details and be sure to check out our OldCity.com Calendar for specific events and happenings you won’t want to miss! St. Augustine may seem like a quiet city, but there is a vibrant nightlife offering entertainment to match any mood or personality, from biker bars to karaoke joints to sophisticated jazz clubs. Take in a martini along the bay, dance at a rooftop jazz club, bar hop on Anastasia Island with your feet in the sand, sing along with pirates in a tavern without electricity and test your beer pong skills downtown, all in the same night (if you have a designated driver!). If your accommodations are in the historic district, you’ll find that many of the best pubs and clubs are within walking distance—eliminating your worry of who’s going to be driving. After sunset, the hidden mysteries of the over 450 year-old settlement come alive. Strolling along beneath the stars, it’s hard not to think that there might be someone (or something) peeking at you from around the corner of that narrow, cobbled alleyway. By partaking in one of St. Augustine’s nightly ghost tours, visitors can experience the dark periods of the city’s past, from the Castillo’s bullet-riddled executioner’s wall to the room in the historic Flagler College dorms that Henry Flagler sealed off to confine his and second wife as she went insane. But not all ghost tours are the same. Choose from an informative, scientific excursion with ghost detection equipment or a more dramatic adventure with re-enactments of a few twisted tales. Some tours are on foot while others can be taken in trolleys, hearses and even sailboats. These tours offer something to believers and non-believers alike. Face your fears! 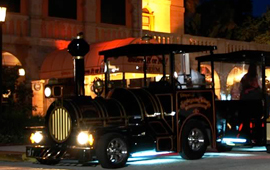 Join us on Ripley's Ghost Train Adventure for the most interactive paranormal experience in St. Augustine when we take you to THREE of the most haunted locations in the Nation's Oldest City. Investigate unexplained phenomena, residual energies, orbs, and other ghostly manifestations. Enjoy the bay breezes on our verandah or sit inside our cozy bar while sipping one of our specialty martinis or other creative drinks from our full service bar. It's the perfect spot for a romantic evening, a get together after work, or any occasion. 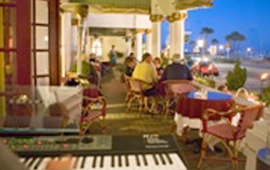 Relax and listen to live jazz on Friday and Saturday evenings.